How will I produce pure water? There are many options, and these can range in price. A simple deionization (DI) tank can cost under $200 to a multistage reverse osmosis deionization (RODI) unit with gas powered pumps that could cost several thousand dollars. While it’s easy to think that the more expensive unit would naturally be more profitable, that is not necessarily the case. When choosing which purification system is best for you, the first thing you need to know is your local Total Dissolved Solids (TDS) reading. You can buy a TDS meter, which will give you a quick reading, or you can visit www.mylocaltds.com, enter your ZIP code (and/or a few neighboring ZIP codes), and see whether there is information about your locality. If so, you can click through to get very good information and advice on which purification solution is best for you and what to expect in operating costs. Either way, once you know your local TDS reading, you will be able to choose the most efficient way to produce pure water. What type of pole should I buy? There are many options here as well. Lengths range from under 20’ to over 65’. In addition, materials vary, from inexpensive options like aluminum or fiberglass to pricier materials like 100 percent carbon fiber, high modulus carbon fiber, and even ultra-high modulus carbon fiber, and as a result prices range from a few hundred to a few thousand dollars. Therefore, it is good to seek guidance to navigate the wide variety of choices. For guidance in making a good decision, www.waterfedwindowcleaning.com is an interactive website with a step-by-step questionnaire designed to help you decide what type of pole would best fit your needs. Will I need traditional tools? While pure water window cleaning is all the rage, it does not replace traditional window cleaning. Occasionally you will find window styles that are not conducive to pure water window cleaning. 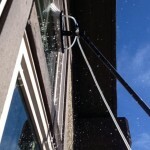 In addition, pure water window cleaning is for exterior windows. If you plan on offering interior window cleaning, you will want at least some basic traditional window cleaning tools, such as squeegees, T-bars and covers, a bucket, soap, and some towels. While these tools may stay on the truck much of the time if you are only cleaning the exterior of modern windows, they are a necessity to own. Matt Adwell is the president of Adwell Services, a residential & commercial maintenance company based in Annapolis, MD. He is also co-founder of ACCELR8 Technical Training, which will be hosting a window cleaning training class on August 6 in the Washington, D.C. area. He has been cleaning windows professionally for the last 23 years. He will also be speaking at the 2015 Pressure Washing & Window Cleaning Convention & Trade Show, August 7-8 in Washington, D.C. To register for the convention, go to www.TheHugeConvention.com, then use the coupon code “ECLEAN” to save $25.